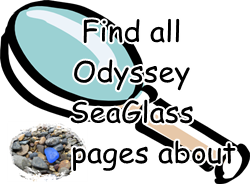 ~ sea glass contest photo was submitted by Jeanine Hinman, Buffalo, N.Y.
What were your feelings or impressions when taking this photo of beach glass? My husband and I were walking on the beach on a cold but sunny day. There is still a lot of snow on the beach and as we were trekking through the snow mounds I saw a a little red coming through the snow . 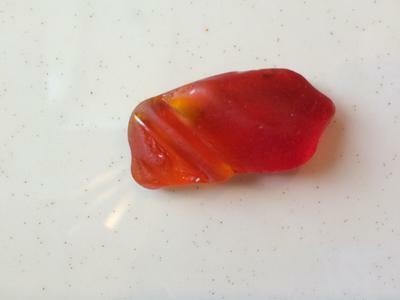 Thinking it was probably a piece of plastic I went over and kicked around the snow only to find the most perfectly shaped and washed piece of beach glass w all the rarest colors in one red yellow and orange. I was so excited to find a awesome pendant piece especially in the winter. Hi. I have a very very similar piece that I found last spring in Malibu, CA. Yours and mine look almost identical. Very cool! Look at my photo I entered in July's photo contest 2016. Congrats! I know how fun it was to discover!